Wade was eager to leave Budapest,having stayed in the city for over a month last summer working in a hostel. So we got on a bus and headed to the south, and ended up right next to the borders of both Serbia and Romania. “Where do you want to go Serbia or Romania?” Wade asked. I shrugged. I love crossing borders. Walking across is my favorite, but crossing by bus is okay too. The best part is that no-man’s land between the two check points. The crossing into Serbia was standard, we didn’t even need to get off the bus. The immigration official just walked down the center row of the bus stamping passports and asking questions as he went. He soon arrived to where I was sitting, took my passport, leafed through it looking at the entire collection of stamps, then began interrogating me. “Where are you going?” he asked — as in, Where in Serbia are you going? My mind went blank, no words came to my mouth. I had no idea where I was going in Serbia. 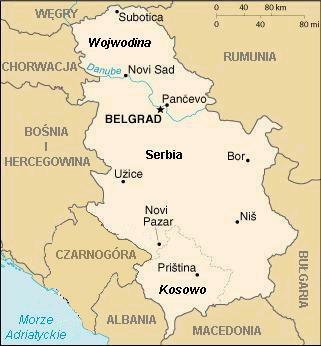 The decision to even come to this country was made on a coin toss, I had no idea of the name of any town in the entire country save for Belgrade. I looked at the immigration official with a black face. Pregnancy takes a toll on a girl’s mind, leaving her with only the dregs of its former capacity. Luckily, Wade, who was sitting in the seat behind me, jumped in. “We are going to Belgrade,” he spoke assuredly (it was obvious that he had no idea of the name of any other town in Serbia as well). The immigration inspector looked at him and asked about our relationship. “She is my wife,” Wade answered, and everything became clear: it is standard for men to speak for their wives in most countries in the world. I was then stamped into Serbia and the immigration inspector moved on to take Wade’s passport. We arrived in Belgrade at night. I haven’t eaten and I was very hormonal (which is a nice way to say indecisive, moody and mean to Wade). We got off the bus and Wade, who had written down the address and directions to a hostel he found online, said he thought it was to the right of the bus station. The lights of the city started to peter out, we were quickly walking out into the middle of nowhere. “Why don’t we ask someone?” I said. Wade kept walking. “Let’s ask those policemen,” I said. Wade crossed the street away from the police. We walk another block. “Maybe we should go back and ask someone,” he says. We ask the police. They direct us in the opposite direction that Wade was previously walking in, up a steep hill. Halfway up the hill we stop again to ask directions at a pharmacy. Pharmacists are educated, so have a better chance of speaking some English, making it a good place to ask directions from. They are also usually not able to leave their post and follow us around. We received good indication that we are headed the right way, up the hill. We keep walking until we reach the top which was a large pedestrian street filled with groups of teenagers, couples, popcorn vendors and bookstores. We stop in at a bookstore and asked directions again, they didn’t know anything. We stop in another. They point us to the left. We stop in a grocery store, they don’t know. We stop in a bakery. They laugh at us and point us across the street. We made it. It had been a long day of traveling and I was exhausted and happy to be home for the night. “Do you want a beer?” The beautiful Serbian girl working at the hostel asked in heavily accented English. “No thanks” I said with a smile. She nodded and then turned back to the computer. Finally Wade couldn’t stand it anymore. “She’s pregnant,” he explained, patting my belly to make sure she understood. “Really? !” She turned to me for confirmation. I nodded and grinned. Wake up and eat yogurt. Pound on the bathroom door (who the hell has ever heard of a hostel that only has one toilet?) because I need to throw up the yogurt. Go for a walk with Wade. Come back exhausted and sleep. Fight with Wade because I’m nauseous and don’t want to eat and he thinks I need to eat gross roast chicken from the supermarket. Compromise to eat more yogurt. Talk with the characters staying at the hostel including an American, his Serbian wife and their six year old daughter who live at the hostel. Go on another walk. Buy vegetables, bread and yogurt. Eat dinner. Watch other young people get ready to go out to clubs. Pound on the bathroom door because I need to throw up again. This is Nathan, one of Wade’s friends. You are doing a great job with the Mommy Blog, keep it up. Hope that I get to see all three of you when you visit WNY. And remind me to give you your wedding/baby/travel gift.